The X9 Protank rebuildable is a state of the art, bottom feeding clearomizer with a Pyrex glass tank and replaceable coils. You’ll love its bright colors and clouds of vapor. It is also 510 threaded, which means it will fit and work with all of your eGo batteries. The X9 is similar to the C3 except the X9 has a 3ml tank and has an updated coil/head/wick that can be replaced. Being able to replace the coil/head/wick means $$ savings for you. You don’t need a syringe or special bottle when filling these, just remove the bottom, fill and then replace the bottom and you’re ready to vape. As opposed other Clearomizers, the X9 has a mouthpiece that is attached permanently and its filled from the bottom. This means that if you need to replace the coil/head/wick, you are able to do so without having to empty the liquid out of your clearomizer. Fill with 3ml E-Juice by tilting the X9 Tank at a slight angle and dripping juice down the inside wall against the outer wall of Glass Tank. Do not put eliquid into the center tube as it will leak out the bottom of clearomizer. Screw the bottom assembly back onto tube. Screw onto electronic cigarette device and you're ready to vape. When unfastening the base (atomizer head) to refill the Clearomizer, the seals are temporarily broken and liquid will leak from the mouthpiece or escape into the center tube. Always wrap a cloth or piece of tissue around the mouthpiece when unfastening the base of the X9 Tank Clearomizer. The atomizer head of the X9 Tank can loosen when unscrewing the tube or base. Always secure the atomizer head before re-installing the base of the X9 Tank. It is normal to find a small amount of liquid in the battery contact area when removing the Clearomizer or any atomizer. Always clean the battery threads before charging it. 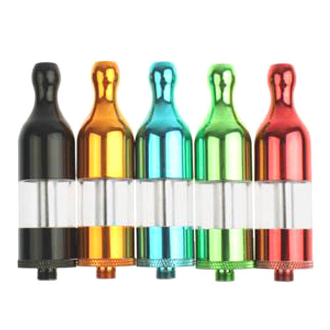 X9 Tank Atomizer heads have an average lifespan between 10 to 20 days. When the atomizer head wears down, it may begin to leak.